Starling Fitness - Fitness, diet, and health weblog » My Higher Power: Lose It! My Higher Power: Lose It! One of the biggest stumbling blocks for atheists and twelve-step programs are the first few steps. In particular, the requirement to believe in a Higher Power as you know it. I may not be able to believe in an omnipotent, omniscient, omnipresent being who actually CARES about my inability to stop eating, but I can lay all my trust in science. One piece of science that has been debated is the Calories In Vs. Calories Out concept. There are those who don’t believe this is the case and that you can eat far more food as long as you tweak the macronutrients. Honestly, I NEVER lost weight when I ate more calories than I burned. I feel fuller when my protein and fat are higher than my carbs, but if I ate more calories than I exercised away, I didn’t lose weight. So, I decided that one of my atheist Higher Powers was Lose It!. It runs on the web, on an iPhone and an Android phone. I put in my age, gender, weight and height into their system, told them I wanted to lose at least a pound a week and then I have faithfully followed their calorie counts. I just turned over all my food thoughts to Lose It. I can even monitor my carbs, protein and fat percentages, trying to manipulate them to keep me feeling fuller. Entering food is easy. I can make recipes and find out the calorie counts for our favorite dinners. It even works with my Fitbit. Most importantly, there is a community aspect to Lose It. If you have friends, you can post on the activity stream, asking for advice. Unlike a prayer to God, my Lose It friends can ANSWER my questions and help me through hard times with words of encouragement and advice. I can set my privacy as much as I want, but I let them see all of my food, exercise and weigh-ins so that they can have the full picture of my food life. It may sound strange to believe in a web app as one’s Higher Power, but my hunger response is BROKEN. I’m hungry all the time and I can eat until I’m in PAIN and still want to eat more. 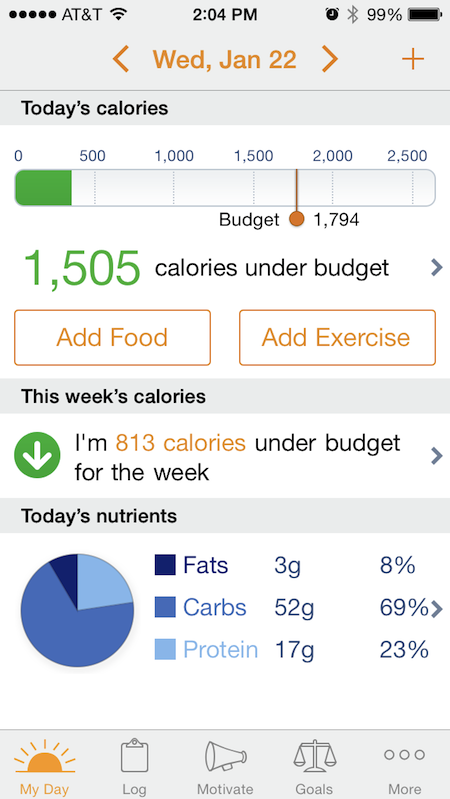 Using the Lose It app as my Higher Power has relieved me of all those decisions that I used to make about food. Are there calories left in my day? Then I can eat. If not, I’m done. I have just released all of my decisions about food to this Higher Power and my life is more sane because of it. Overeaters Anonymous does not endorse anything on this entry or blog.